Telomeres comprise the six nucleotide repeats at the end of eukaryotic chromosomes and they are essential for the faithful replication and protection of our genome. Significant telomere attrition forces the cells to enter a dormant state to prevent genomic instability. This state is referred to as senescence, the hallmark of aging. Interestingly, constitutive replication of telomeres leads to cell immortalization, a process linked to cancer. Fig. 1. Atomic model of telomerase. Crystal structure of the catalytic subunit of telomerase TERT in complex with the RNA template and telomeric DNA (blue – PDB ID: 3KYL); the activation domain CR4/5 (lemon – PDB ID: 4O26); and the template boundary element (green – TBE – PDB ID: 5C9H). 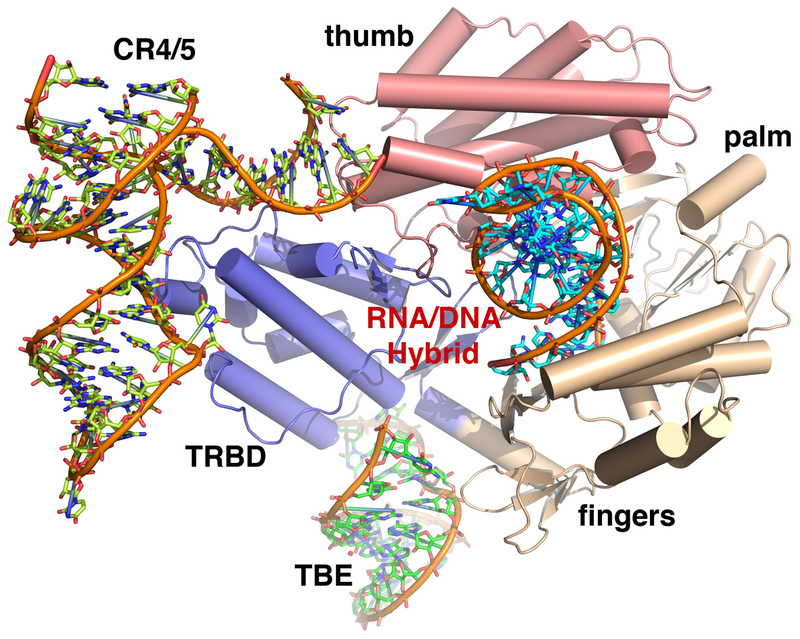 The TERT TRBD, RT (fingers and palm) and thumb domains are shown in blue, wheat and salmon color respectively (PDB ID: 3DU6 and 3KYL). Telomeres are replicated by telomerase, a ribonucleoprotein reverse transcriptase. The core, functional, telomerase holoenzyme consists of a protein subunit (TERT), which catalyzes the reaction of nucleotide addition and an integral RNA component (TER), which provides the template TERT uses for telomere replication. Long since its discovery, telomerase has been the subject of significant interest due to its implication in a host of human diseases. Several naturally occurring mutations within TERT or TER are linked to bone marrow failure syndromes. These include dyskeratosis congenita (DKC), aplastic anemia (AA), and idiopathic pulmonary fibrosis (IPF) and they stem from single amino acid mutations that interfere with the proper assembly of TERT with its nucleic acid substrates. In addition to its role in bone marrow failure syndromes, telomerase is also an important player in cancer and aging. It was shown in 1990s that telomerase is highly active in more than 85% of human cancers, when such activity was undetectable in adjacent healthy tissues. Continuous telomere replication allows for the uncontrollable proliferation, tumor growth and metastasis of most cancer cells. Telomerase inhibition would force cancer cells to enter senescence thus preventing the growth and spread of cancer. As a result, telomerase has been considered a universal target for cancer therapies. Understanding the structural organization of TERT as well as how it assembles with its nucleic acid substrates to generate a functional complex has been a major challenge due to the complexity of the enzyme. Recent advances in structural and molecular biology have allowed for the determination of the atomic structure of the full length, catalytic subunit of telomerase form Tribolium catsaneum (Fig. 1). The structure revealed that TERT consists of at least four conserved domains. These include the RNA binding domain (TRBD), which is essential for TERT-TER assembly, template positioning to the active site of the enzyme for catalysis, and repeat addition processivity; the reverse transcriptase domain (fingers and palm), which contains the active site of the enzyme; and the c-terminal extension (thumb domain), which binds TER and the telomeric DNA overhang allowing the enzyme to assemble at the end of chromosomes during telomere replication. The TERT domains form a closed ring configuration that is structurally similar to the polymerase domain of HIV RTs and viral RNA polymerases. TERT domain organization generates a large cavity in its interior, where a host of highly conserved motifs that bind specifically the telomerase RNA template and the telomeric DNA overhang are located (Fig. 1). Subsequent structural studies have provided evidence of how TERT binds the highly-conserved, activation domain (CR4/5) and template boundary element (TBE) of TER to form a fully functional telomerase holoenzyme (Fig. 1). Taken together the data generated in the past decade has provided significant mechanistic insights into telomere replication by telomerase. It has assisted in the interpretation of biochemical and cell based studies. It has also provided the platform for the identification and design of drugs as potential therapeutics for cancer and age related diseases. Although we have made significant strides in understanding the atomic structure of telomerase, much remains to be learned and that can only be achieved with the high-resolution structure of the telomerase holoenzyme.